the colorful and creepy Zap the Zombies featuring creatures of the un-dead! Zap the Zombies uses a cross bow propel Velcro darts at the targets. 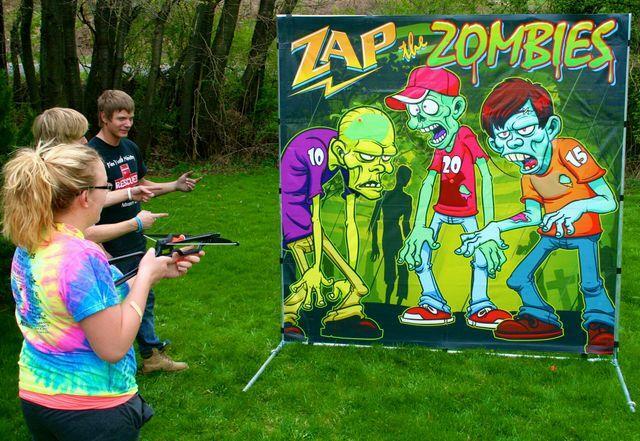 Zap the Zombies can be set up in less than five minutes and can be used indoors and out. * Please call us for any questions on our game zombie zap the rentals in Cleveland, Chardon OH, Mentor OH, Chagrin Falls OH, Ashtabula Ohio and surrounding communities.